Since it opened in 2014 in a leafy Buenos Aires neighbourhood, Casa Cavia has carved out quite a name for itself, drawing an appreciative crowd to its high-ceilinged warren of rooms that are variously staged as restaurant, publishing house, bookstore, florist and perfumery. Perhaps as a recognition of the economic realities of running a multi-functional space and the margins involved, owner Guadalupe García Mosqueda has increased the food and beverage offerings. 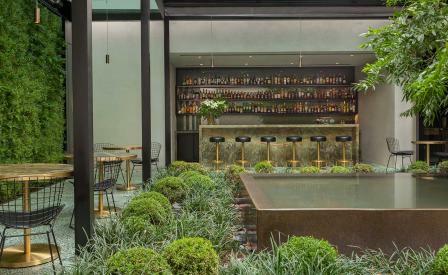 Once again, Kallos Turin Architects have been recruited for the job of expanding the F&B spaces, including a larger, bright kitchen, and a courtyard bar framed by the existing square pool, an emerald green living wall and high brass and leather stools. A more significant change is the appointment of Julieta Caruso as the new head chef. Fresh off nearly a decade long stint with Mugaritz, the native Argentinian’s new menu cleverly riffs off Casa Cavia’s bibliographic bent in which each dish is inspired by a global spread of books and authors. Though the literary lineage is not always immediately obvious, it’s still a fun exercise in interpretive dining when confronted by beef cheeks and vegetables (Emilia Pardo Bazán’s ‘The House of Ulloa’, and chocolate cookies with dulce de leche (Margaret Mitchell’s Gone with the Wind. Meanwhile, we have William Faulkner to thank for the cocktail of mint, sage, green apple whiskey and cinnamon. We’re already prepping for our next book club meeting.